Many of the mushers will choose to take their mandatory 24-hour stop in McGrath while others will check into McGrath and move on to Takotna for their long rest. Still others will go further down the trail before taking their 24-hour break. For those who spend 24 hours in McGrath, they’ll leave for Takotna with fresh and eager dogs. This trek will be a short 18-mile run that should take about 2-3 hours. Mushers will immediately head down to the Kuskokwim River, which is a half mile wide at this point. This will take them directly to the mouth of the Takotna River. After about a mile they’ll leave the river to slowly climb west for roughly eight miles through swampy land. Five miles or so down the trail, they will cross another river, the Tatalina River; however, it might not be that noticeable. This part of the trail is heavily trafficked by snow machines which can make for some ruts. This is about the only thing that will slow a team down on this fast run. Many will choose to do this run at night, but for those that do the run during the day, they’ll be able to view the summit of Tatalina Mountain, 3200 feet. At this point they are running along a ridge that will eventually head 500 feet down the mountain back to the Takotna River. It will be a quick couple of miles until they reach the checkpoint. I spoke with volunteer and teacher, Tabitha Meglitsch, who lives in the village of Takotna, and learned some interesting information about the village. Takotna was founded as a supply depot for the local mines a little over 100 years ago. At that time, Takotna was a very large community. Today, there are about 50 residents. In the village there is a post office, school, water distribution building, Takotna Tribal Council, and the Takotna Community Association. The residents are a mixture of Native Alaskan, Caucasian, and Hispanic. Folks in the community get along very well with each other. They act as a large family, helping each other out whenever necessary. 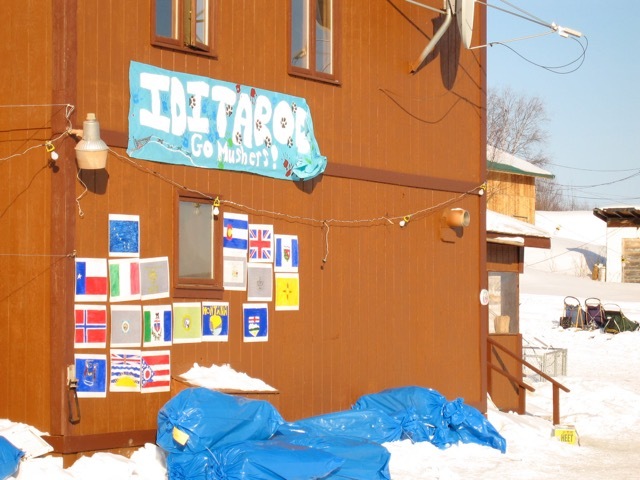 The Iditarod is an important part of the culture in Takotna, especially since historically the whole village volunteers during race time. Prior to the start of the race they will cut and split 4-5 cords of firewood. A cord of wood is any dimension of stacked wood that adds up to 128 cubic feet. The firewood is used to provide mushers with hot water to use to feed their dogs. The community also cleans up the church, library, and Twitchel Building (where the Council offices are located) in preparation for all the visitors. Another job prior to the race is for the village to buy and cook all the food they will serve to mushers, volunteers, and paying visitors. During the race, village residents, both young and old, volunteer to help with the many round the clock jobs. Tabitha’s job is the “Lead Dog Handler.” This means she will organize the parking crews who park the teams that decide to stay in the checkpoint. Tabitha also helps the vets set up the dropped dog area, feed and care for the dropped dogs, and take the dogs down to the airplanes. Other jobs the villagers volunteer for are checkers, cooks, water crew, clean-up and fire crew. These crews are usually split into a day shift and night shift. Many relatives and friends of the Takotna residents come to the village to help out during the race. The village does their best to treat every musher equally, no matter if they are the first or the last to arrive.Takotna’s hospitality is one of a kind. 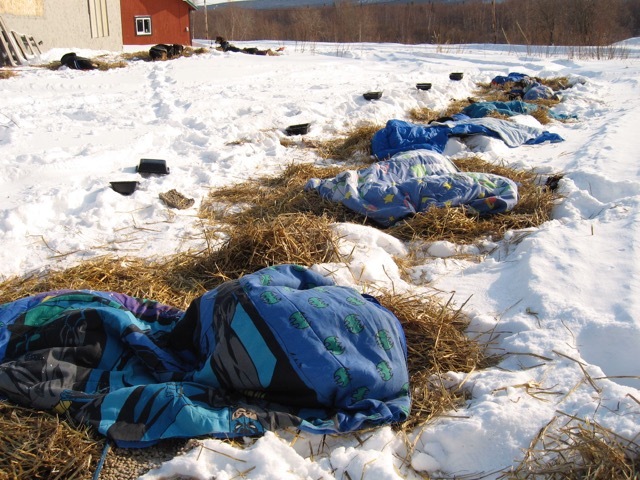 Each musher is offered a steak dinner and their choice of Takotna’s famous pie. 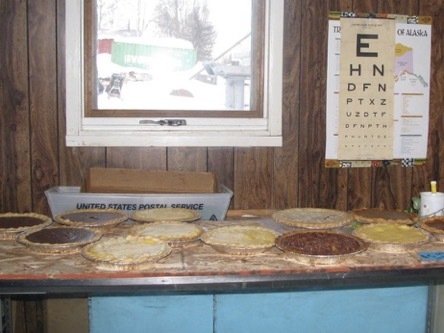 About 80 pies are baked each year for the Iditarod. The pie ladies know just about every kind of pie the mushers enjoy. Sounds like a place you don’t want to leave, but they must keep on moving. 646 miles to Nome. Next stop, Ophir. To read more about Takotna check out Don Bowers Trail Notes and Virtual Trail Journey – Takotna. 1. What percentage of the trail have mushers completed? 2. A common cord of wood is 4 ft in width, 4 feet in height, and 8 feet long. How many cubic feet is 1 cord of wood? 3. If the village of Takotna cuts down five cords of wood, how many cubic feet of wood have they cut down? 4. What is your favorite kind of pie? Look up the ingredients to your favorite pie. How much of each ingredient would you need to make 80 of your favorite pies? 5. Find the price of each ingredient in your pie. Approximately how much would it cost you to make 80 of your favorite pies? 6. If you can fit 2 pies in your oven, how long will it take to make 80 of your favorite pies? 7. Take a poll of everyone in your class. What is everyone’s favorite kind of pie? Make a circle chart showing your classes favorite kinds of pie.